President Barack Obama's statement just before he signed the Freedom of the Press Act on Monday painfully avoided reality to the point of giving offense. If it became widely known, it would likely become very problematic. And obviously the loss of Daniel Pearl was one of those moments that captured the world’s imagination because it reminded us of how valuable a free press is, and it reminded us that there are those who would go to any length in order to silence journalists around the world. President Barack Obama has signed a law intended to provide more protections for a free press around the world. The law, the Daniel Pearl Freedom of Press Act, expands efforts to identify countries where press freedom is being violated. The law is named after Pearl, a Wall Street Journal reporter who was beheaded by militants in Pakistan in 2002. The law expands an annual report on human rights practices to include information about media treatment, and identify countries where the media is being repressed. Obama said the law would be a signal to governments around the world that their actions, including treatment of the media, are being watched. President Obama signed legislation on Monday intended to promote a free press around the world, a bipartisan measure inspired by the murder in Pakistan of Daniel Pearl, the Wall Street Journal reporter, shortly after the attacks of Sept. 11, 2001. 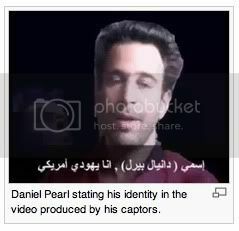 ..."The loss of Daniel Pearl was one of those moments that captured the world's imagination because it reminded us how valuable a free press is," Obama said. ... Pearl, 38, was the South Asia bureau chief for The Wall Street Journal when he was abducted in Karachi on January 23, 2002 while researching a story about Islamist militants. A graphic video showing his decapitation was delivered to the US consulate in the city nearly a month later. Mariane Pearl was pregnant with their son when her husband was murdered. In 2007, she filed a lawsuit Wednesday against 23 individuals and organizations over the abduction and murder of Pearl, naming Al-Qaeda, the group's alleged mastermind kingpin Khalid Sheikh Mohammed -- who claimed responsibility for beheading Pearl and is now in US custody -- and Pakistan's Habib Bank among the defendants. ... its clumsiness and insipidness is most revealing. First of all, note the passivity: "The loss of Daniel Pearl." He wasn't "lost." He was kidnapped and beheaded. He was murdered on a snuff video. He was specifically targeted, seized as a trophy, a high-value scalp. And the circumstances of his "loss" merit some vigor in the prose. Yet Obama can muster none. But what did the "loss" of Daniel Pearl mean? Well, says the president, it was "one of those moments that captured the world's imagination." Really? Evidently it never captured Obama's imagination because, if it had, he could never have uttered anything so fatuous. He seems literally unable to imagine Pearl's fate, and so, cruising on autopilot, he reaches for the all-purpose bromides of therapeutic sedation: "one of those moments" – you know, like Princess Di's wedding, Janet Jackson's wardrobe malfunction, whatever – "that captured the world's imagination." Notice how reflexively Obama lapses into sentimental one-worldism: Despite our many zip codes, we are one people, with a single imagination. In fact, the murder of Daniel Pearl teaches just the opposite – that we are many worlds, and worlds within worlds. Some of them don't even need an "imagination." Across the planet, the video of an American getting his head sawed off did brisk business in the bazaars and madrassahs and Internet downloads. Excited young men e-mailed it to friends, from cell phone to cell phone, from Karachi to Jakarta to Khartoum to London to Toronto to Falls Church, Virginia. In the old days, you needed an "imagination" to conjure the juicy bits of a distant victory over the Great Satan. But in an age of high-tech barbarism the sight of Pearl's severed head is a mere click away. And the rest of "the world"? Most gave a shrug of indifference. And far too many found the reality of Pearl's death too uncomfortable, and chose to take refuge in the same kind of delusional pap as Obama. I daresay that if a Republican or conservative president had suggested that the "loss" of Dr. Martin Luther King had "captured the world's imagination," the AP and the Times would not have so deliberately avoided such a statement, and would instead have eagerly sought out others to criticize it.